The kids are back at school, and guess who’s doing a happy dance?! Well, Monty Python and me. Don’t get me wrong, it was a GLORIOUS summer. Temps reached 80 degrees maybe 4 days. We had plenty of rain at night, green grass, and sweet breezes during the day to keep the bugs down. It was the kind of northern New England summer that On Golden Pond makes you think happens every year. Temps have been so cool, in fact, that my tomatoes have had tough time ripening and the leaves on the trees are already turning!! 3 weeks early!!!! Though it’s hard to say goodbye to probably the best summer we’ve ever had as a family, I can’t help but be excited for fall, my absolute favorite New England season. Crunching leaves, pungent fires, fragrant apples, and sweet cider…. 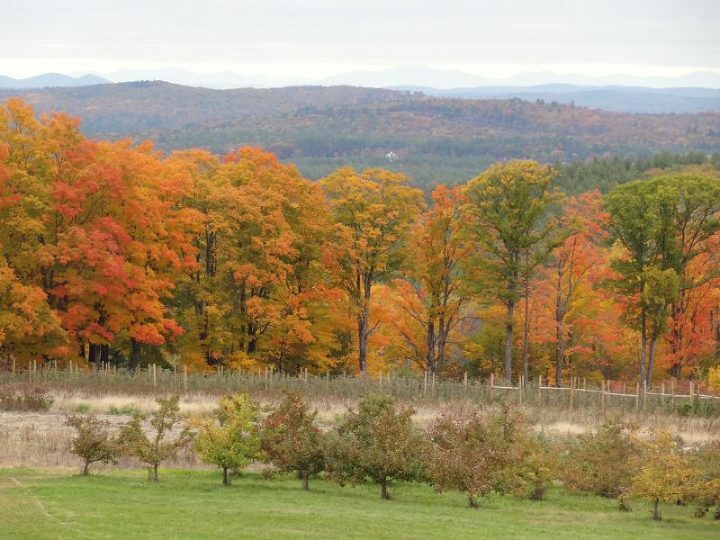 In a couple of weeks, you’ll find me leaping like a gazelle through Gould Hill’s orchard (one of USA Today’s “10 Most Beautiful Orchards,” located here in our very own town) exclaiming, “I’m a child of the fall!” like the corny idiot I am. For the decorator in me, nothing (else) gets me more in the mood for fall than cozy cabin decor — wool throws and pillows, plenty of stripes and plaids, and a pooch in front of a roaring fire. You can still camp … if you’re dressed right! We’re hardy up here. Especially if we’re glamping. The above just screams Pendleton Americana to me. BTW, have you ever checked out Pendleton’s Instagram feed? The company also has the hashtag #mypendleton, to which, supposedly, anyone can contribute. However, I notice that everyone who is in the posts is so unbelievably model-beautiful, that I have to think it is “curated,” i.e. edited for photogeneity. This is not me, though I wish I looked this beautiful with my boys. A very pretty pic via Instagram from @junobella. 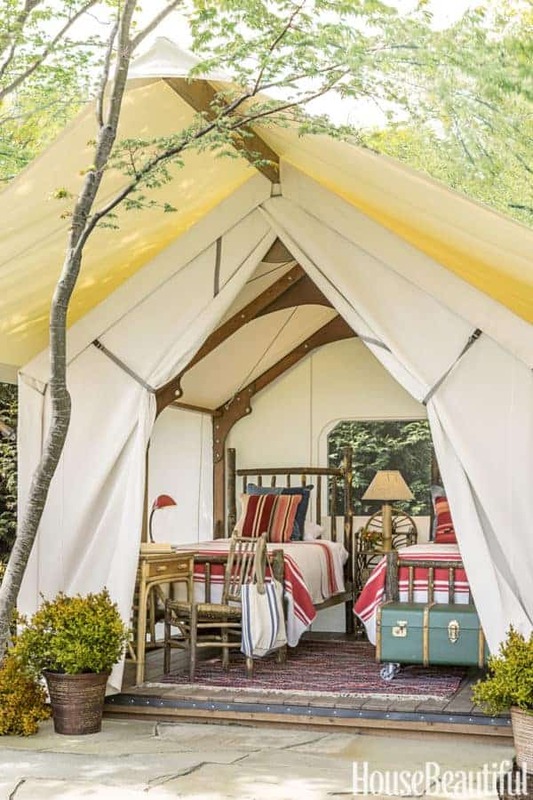 If I ever got to decorate my own vintage trailer and glamp it up (instead of pitching our tent), man, I would use this collection in a heartbeat! Muddy, wet kids and dog? No problem! … but those of us who are a little more “tied down” (i.e. by children and poured cement foundations … or granite rubble in my case) with other responsibilities also find the style incredibly alluring. The look of Pendleton makes for super cozy fall interiors. Million-dollar designer Thom Filicia LOVES this look. Above 3 images from Thom’s lake house. Above 2 images from a house in the Adirondacks. Above 3 images from Thom’s portfolio. You can’t buy the fabric unless it’s through a designer (Pindler’s new line is available to Home Glow Design clients! 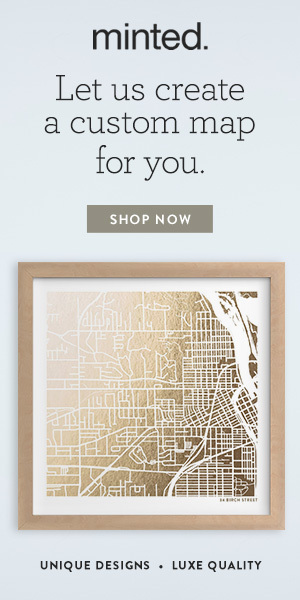 ), but a few throw pillows and floor pillows are available through Pendleton and Amazon. Pindler’s new collection hasn’t been out long enough for designers to start using it on upholstery, but look around Etsy, 1st Dibs, eBay, and Chairish, and you’ll find lots of vintage inspiration of with pieces reupholstered in regular Pendleton fabrics or blankets. While the above pieces are super pricey, Pindler’s new fabric line is very reasonably priced. Fabric for reupholstering vintage pieces similar to the above would cost about 1/10th of those prices. Wood framed furniture is usually inexpensive to have reupholstered or fairly easy to DIY, so be on the lookout for that awesome vintage piece at a bargain price! Even if the Pendleton style is not my everyday cup of tea, I could certainly take it for my mountain getaway, just like Thom’s one in the Adirondacks! For fun, I did a little Pendleton-inspired mood board in the manner of Thom’s Adirondack chalet. Some great vintage and one-of-a-kind finds here — including a showroom sample McGuire sofa upholstered in wool and a fabulous vintage chandelier from my secret source for lighting! Are you feeling the Pendleton vibe? Do you have any uses for the Pindler’s new Pendleton/Sunbrella line?